Nandyal is a Town in Nandyal Mandal in Kurnool District of Andhra Pradesh State, India. It has a place with Rayalaseema area . It is found 70 KM towards East from District head quarters Kurnool. It is a Mandal head quarter. Nandyal Pin code is 518501 and postal head office is Nandyal . Sbi Colony (1KM),Telugu Peta (1KM),Ponnapuram (2KM),P.kottala (4 KM),Billalapuram (4 KM) are the close-by Villages to Nandyal. 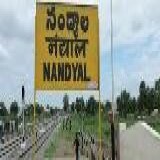 Nandyal is encompassed by Mahanandi Mandal towards East , Gospadu Mandal towards South , Panyam Mandal towards west , Bandi Atmakur Mandal towards North . Nandyal,Chapirevula,Banganapalle,Bethamcherla are the close-by Cities to Nandyal.